The Hampton Nautical Special Solid Brass 4-inch sextant has a slow motion control to allow fine adjustment of the elevation angle. A built-in magnifier can be swung into position to assist in reading the German Silver vernier scale, and there are six swing-arm filters. 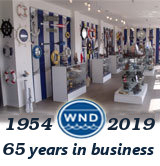 The sextant is engraved "Hampton Nautical." These models are perfect for the collector or the beginner interested in learning celestial navigation. 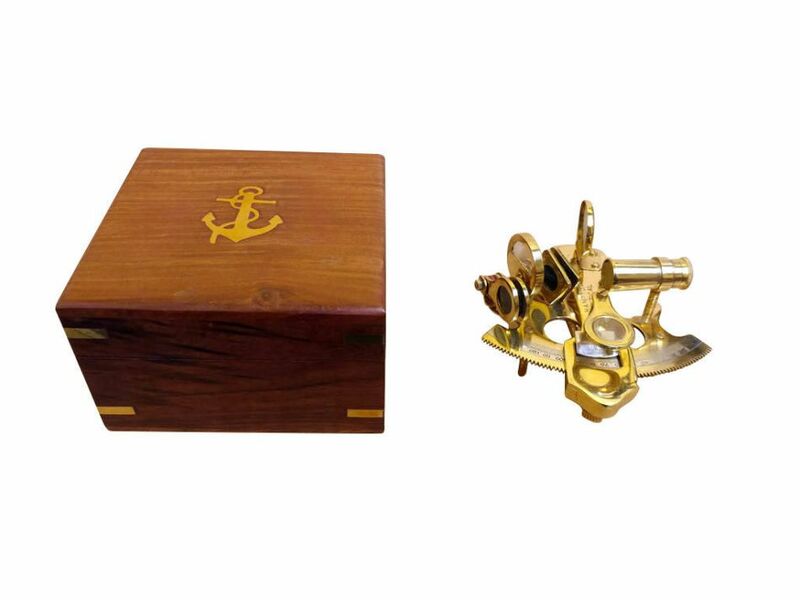 A beautiful handcrafted hardwood storage and display box comes with this solid brass sextant. The case is made out of a high quality smooth finish hardwood. The box has one clasp and a brass filling of The Hampton Nautical anchor and rope embedded in the top of the box. Custom engraving/photo etching available; logos, pictures, or slogans can easily be put on any item. Typical minimum custom order is 100+ pieces. Minimum lead time to produce and engrave is 4+ weeks. Long before the advent of the brass sextant, many cultures across the globe had independently discovered that they could triangulate their position by using the stars. While this was important on land, it became paramount at sea as the earliest sailors were confined to sailing within sight of land. Though the antique sextant would not be created for many centuries, many of these cultures had basic means of celestial navigation, the most common termed “running down the line.” Much as the brass sextant would come to measure altitude of celestial objects, this early form of navigating involved a simple reading of Polaris, or the North Star, and noting its location. Upon leaving home port, the navigator of a ship would use a basic fixed measuring tool to mark Polaris’ location, and on the return voyage the ship would sail north or south until Polaris matched the marked tool; from here it was a simple sail east or west down this line, eventually returning to port. While these early tools aided greatly in sailing and navigation, the brass sextant would allow for readings to be taken anywhere in the world. This early form of navigation was embraced across the world, from the Polynesians to the Arabs. As the sextant did not yet exist, the Polynesians marked celestial latitude with a piece of bamboo atop which was fixed a loop that would align with the horizon and start when the correct latitude was reached. The Arabs, similarly without the sextant used a kamal, which was a rectangle of wood attached to a knotted string. The length of each knot corresponded with a port, and by holding the rectangle away from the body, with knot in teeth, the correct latitude would be reached when the rectangle fit perfectly between horizon and star. These solid brass sextants for sale were a revolution in nautical navigation, forever changing life at sea.